Berkeley’s famous and beautiful Hotel Durant has one of the best things we’ve spied in a while: a Stanford urinal. It’s in the men’s bathroom in the lobby, and for bonus points, the Stanford urinal is the only urinal available, so all male guests have no choice but to relieve themselves on the Cardinal Red and that tree (their poor excuse of a marching band calls a mascot). It just goes to show how important the university is to the city and local business. The hotel itself is named after Henry Durant, the first president of the University of California, and is host to many of the guests that visit the university every year. We at the Clog not only applaud this strong show of support of Cal in the famous rivalry — we also encourage it to spread. These urinals should be used all over campus and in the bathrooms at Memorial Stadium as well. The rivalry is one of the biggest sources of school spirit on campus and an important part of our sports history. 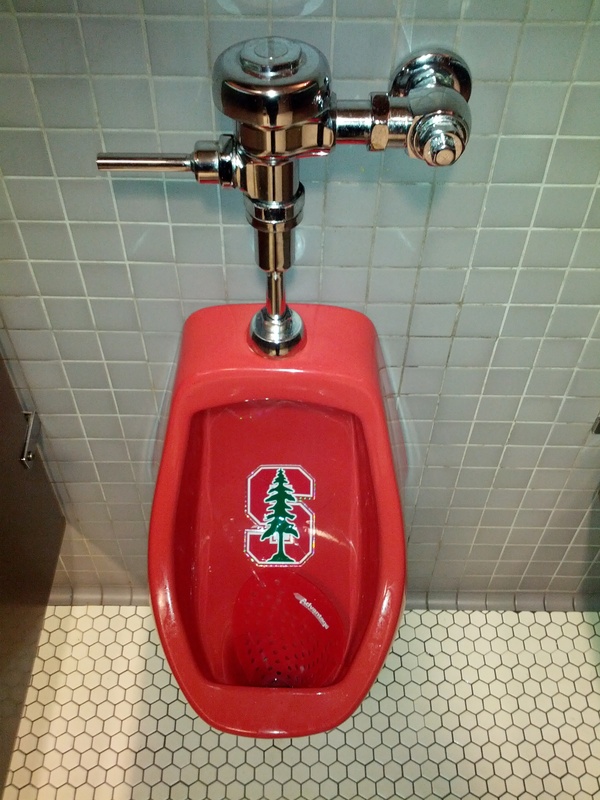 We hope to see more Stanford urinals around Berkeley in the future. Cal Day is Coming. Look Busy! This might sound lame, but somewhere, deep down in our hearts where we buried our senses of innocence and nostalgia, we’re actually kind of excited for Cal Day. Maybe it’s that the weather always seems to miraculously turn out alright, or that the concentration of free stuff in the area is higher than usual, but whatever it is, we’re getting too damn old to pretend our cynicism overwhelms all positive emotion.